One of the great benefits of cryptocurrencies is the fact, that no third parties (like governments, banks or other financial instituations) are required to transact with people all around the world. However with great freedom comes great responsibility. You are soley responsible to secure your cryptoassets and cryptocurrencies. The same holds true for Bitcore BTX. 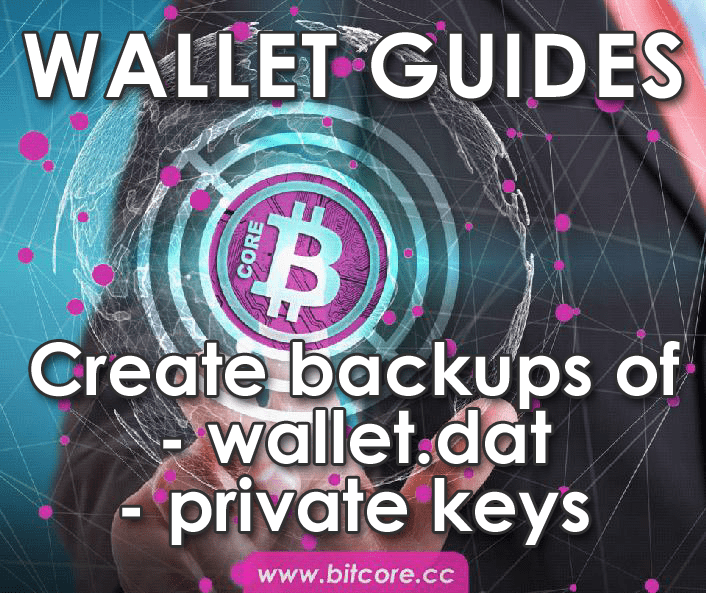 In order to help you along this journey, we created a guide to show you how to backup your wallet.dat and your private keys if you are using Bitcore Core (Bitcore-QT). Try to look for backups for your wallet, when it was not encrypted (without passphrase). Maybe you backed up your private keys? If so, just import them into a new wallet. Passphrases cannot be retrieved if lost! Always make sure to either 100% remember them, but better practice is to just write them down and store in a safe place. pls need help for import mu last back up to a new wallet on mac . Stores the wallet decryption key in memory for ‘timeout’ seconds. 2. timeout (numeric, required) The time to keep the decryption key in seconds. It never says “null” and it never actually unlocks the wallet. Then when I try to “dumpprivkey address” it says I must use “walletpassphrase mypassphrase” first. Thanks…I did that about 30 times and it simply tells me a list of commands instead of actually doing anything. What am I missing here? Not having access to my private keys is not cool. Did you indeed use your walletpassphrase? If you were not able to resolve the issue, please send an email to info AT bitcore.cc and let us know your wallet version and the OS you are using. Thank you. That should do the trick, yes. However, to be absolutely sure, you can just send your entire balance to your registered address. Always use our insight API (blockchain explorer) to verify all your funds are actually located on your address.